What cool things my students did for last week’s Mrs. Dalloway Second Sandbox blog entry! Wonderful pictures of flowers and larks and Big Ben and village greens and green dresses and early 20th century hats and war images and even (my favorite) a sound file of a Buddhist chant. The First Sandbox assignment–annotations of Mrs. Dalloway on a Google doc–were somewhat less successful if you use an old-school rubric of rigor and systematic analysis. But I was pleased that most of the students in this class reapproached the novel as a digital document and found several things to comment on—even as small as a vocabulary word. I shared Marshall McLuhan and Alan Liu as these pieces are in the syllabus, and ambitious students will read them. Reading Liu’s “New Media Encounter” I was reminded of being in a doctor’s office as a child, watching cursive letters flow from a nurse’s pen. When I got home I tried to conjure meaning from loops and waves myself with a Flair pen–as does the chief in Liu’s quote of Levi-Strauss. To deepen the encounter with dominant, residual, and emergent media, I assigned Elizabeth Eisenstein’s chapter on “Some Features of Print Culture” from The Printing Revolution in Early Modern Europe (Cambridge UP 2012). This is a very sophisticated chapter and, thinking of my CC audience, I created a slideshow that walks students through the major points that Eisenstein makes. 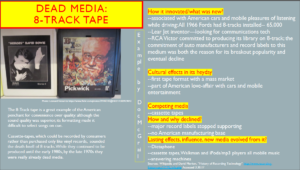 Of course, her argument is deeply complex and embedded in a conversation about print culture that historians are having, so my slides may be a bit oversimplistic. 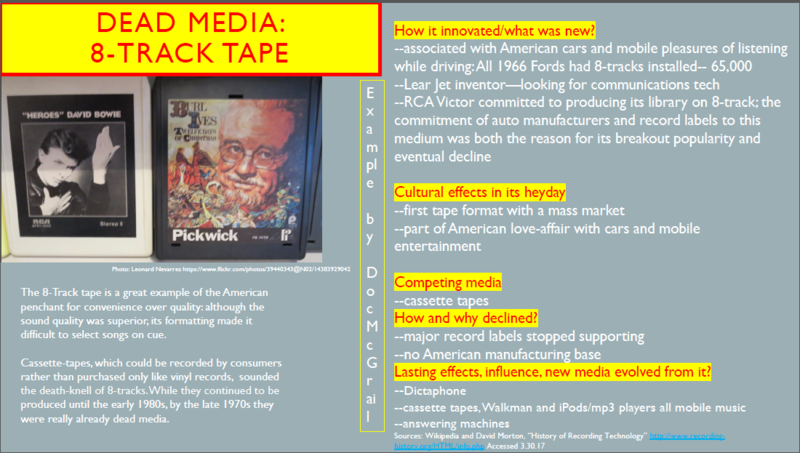 But I think that these slides convey the most important of Eisenstein’s major ideas about print media for students. So here are my notes on Eisenstein for students with no prerequisite knowledge. 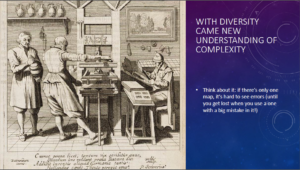 This was a really good intellectual exercise for me: to first boil down the features of Eisenstein’s argument most salient for community college students, and then to try to make them accessible enough to novice, online learners. My measure of success will be that they have completed all of the slides! 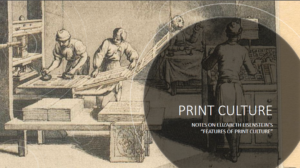 I hope students will be able to see the most important discoveries about print culture: that print wasn’t only an aid to Enlightenment thinking but also infused mystical culture into texts; that printers were as important to knowledge production as scholars; and that printing multiple copies of the same text in multiple locations to be read by diverse readers was perhaps a more important development for the progress of science than was individual ownership of multiple texts. This entry was posted in Uncategorized on April 13, 2017 by Anne McGrail.